Periapical lesions are the most common pathological conditions involving teeth which often require surgical intervention. To achieve optimal healing both clinically and radiographically, bone grafts and barrier membranes have been used to fill the periapical defect after degranulation of the lesion. Colostrum is one of the new materials, which has osteoinductive or regenerative potential. The present case reports describe the use of bovine colostrum in the treatment of periapical inflammatory lesion with a follow-up period of 12 months. These case reports suggest that colostrum can be used to fill the periapical defect after degranulation, which has a favorable outcome. Endodontic treatment is considered successful by achieving both clinical and radiological normalcy. Periapical lesions are the most common pathological conditions involving teeth. Periapical inflammatory lesion is the local response of bone around the tooth apex that develops after the necrosis of the pulp tissue or extensive periodontal disease. Successful treatment of periapical inflammatory lesion depends on the reduction and elimination of the offending organism. Treatment alternatives include root canal therapy, periapical surgery, or extraction of the tooth. To induce complete bony healing of the lesion and restoration of the periodontal ligament is the ultimate goal of endodontic treatment when applied to teeth with periapical lesions. Achieving this goal often requires up to 24 months, with a success rate of 72%–87%., Previous studies have reported that treatment of 24.5% of the referred cases with periapical lesion was impossible without surgical therapy. Periapical surgery involves curettage of all periapical, soft tissues and sometimes application of different biomaterials to enhance new bone formation at the defect site. To achieve optimal healing both clinically and radiographically, bone grafts and barrier membranes have been used to fill the periapical defect after degranulation of the lesion., These approaches are referred to as regenerative therapies. Colostrum is the initial lacteal secretion from the mammary glands after parturition during the first 24–72 h. This “early milk” has a nutrient profile that differs substantially from “mature milk.” Included in its nutrient profile is a high level of bioactive components such as immunoglobulins (Igs), growth factors, in addition to proteins and enzymes. Bovine colostrum is also rich in oligosaccharides, antimicrobials, and immune-regulating factors.,, Taking all these factors into consideration, in the present cases, bovine colostrum powder has been used to fill the bony defect during periapical surgery. The study protocol was approved by the Human Rights and Research Committee – Mamata Dental College, Khammam, India. Informed consent was obtained from each patient. A 26-year-old male patient presented for endodontic therapy with the chief complaint of discolored teeth in the front region of upper jaw. Dental history revealed a traumatic injury influencing the premaxillary area 5 years ago. On clinical examination, there were two discolored maxillary central incisors [Figure 1]a. Pulp sensibility tests confirmed the right central and lateral incisor and left central incisor as nonvital teeth, which were sensitive to apical palpation. 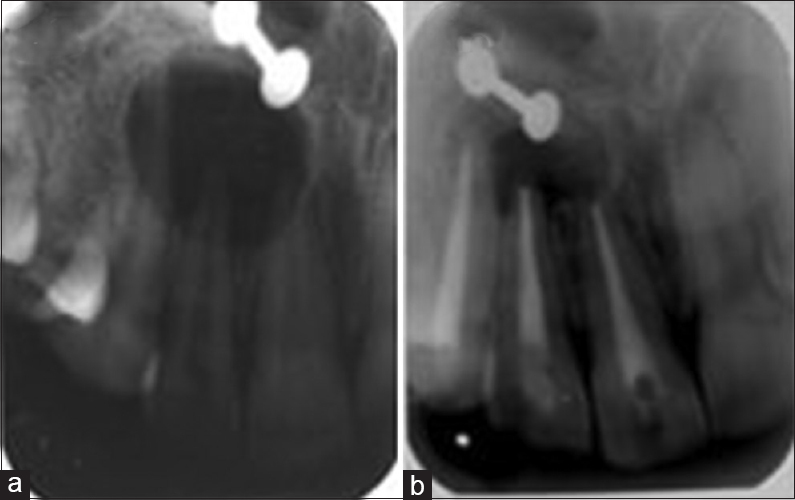 A large periapical radiolucency was observed upon radiographic evaluation, at the apical region of right central and lateral incisors [Figure 1]b.
Root canal therapy was completed for the three teeth as the first step of treatment plan. Using step-back technique, the canals were prepared to an apical size #50. 2.5% sodium hypochlorite was used during instrumentation. The roots were obturated with Gutta-percha and zinc oxide-eugenol sealer by lateral condensation technique. As the expected healing did not occur 6 months after root canal therapy, it has been decided to perform periapical surgery. A full-thickness submarginal flap was reflected with two vertical incisions, one at distal of tooth #12 and other at mesial of #21. Loss of labial cortical plate was still present. Three millimeters of apical root resection was done. Curettage of the lesion was followed by sterile saline irrigation, and the defect was filled with commercially available powdered bovine colostrum [Figure 1]c. Wound closure was obtained with 3-0 silk sutures. Antibiotic (amoxicillin + clavulanate) and analgesic (ibuprofen + acetaminophen) were prescribed for 5 days postsurgically. The patient was instructed to use 0.2% chlorhexidine gluconate mouth rinse for 10 days. Healing was better than usual clinically on the day of suture removal (10 days after surgery) [Figure 1]d.
The patient was recalled at 1st, 3rd, 6th, 9th, and 12th month, for clinical and radiographic evaluation. The patient was asymptomatic for 3 months after the surgical procedure. The size of the radiolucency gradually decreased during 6, 9, and 12 months. Although complete reduction in radiolucency did not occur, the radiographic healing was satisfactory at 12 months [Figure 1]e.
A 30-year-old female patient presented for endodontic therapy with the chief complaint of discolored tooth in the front region of upper jaw. Dental history revealed traumatic injury to the tooth 6 years ago. On clinical examination, there was discolored maxillary right lateral incisor. A huge periapical radiolucency was observed upon radiographic examination at the apical region of right central incisor, lateral incisor, and canine [Figure 2]a. Pulp sensibility tests confirmed that these three teeth were nonvital. Endodontic therapy was performed for the three teeth as the first step of our treatment plan. After 6 months of follow-up examination, as the expected healing did not occur and the patient was symptomatic, next step of our treatment plan was to perform periapical surgery. Periapical surgery was performed in the similar way as described in the previous case report. After apicoectomy and curettage of the lesion, bovine colostrum powder was used to fill the bony defect. Wound closure was obtained with 3-0 silk sutures. Analgesics and antibiotics were prescribed. The patient was recalled after 10 days for suture removal. Clinical and radiographic evaluation was done at 1st, 3rd, 6th, 9th, and 12th month. The patient was asymptomatic 1 month after the surgical procedure. There was a gradual reduction in radiolucency during the follow-up periods [Figure 2]b. Development of periapical lesion with subsequent bone resorption is a result of bacterial infection of dental pulp. Bacterial lipopolysaccharides and cell wall components, as well as host-derived substances, produced in response to bacterial stimulation induce bone resorption. Bovine colostrum is a relatively new food supplement, about which the healthcare practitioners have been hearing a great deal in the past few years. It optimizes the immune systems of both healthy and chronically ill individuals. It is the richest of all zoonutrients and is the “ first meal” of all mammals. Colostrum contains high level of bioactive components, for example, Igs, particularly IgG1, growth factors, i.e., insulin-like growth factor-1 (IGF-1), transforming growth factor (TGF) β2, and growth hormone in addition to lactoferrin, lysozyme, lactoperoxidase, cytokines, and nucleosides. Bovine colostrum is also rich in oligosaccharides, antimicrobials, and immune-regulating factors. Hence, bovine colostrum powder (C-Strum; Illuminati, Maruthi bios Pvt. Ltd., Hyderabad, India) has been used to fill the defect in the present cases. One of the important diagnostic tools in assessing periapical pathology is periapical radiograph. Healing of the periapical lesions can also be assessed based on the radiopacity of the lesion although they are 2-dimensional (2D) representations of the 3D structures. Colostrum was radiolucent and gradual decrease in radiolucency was observed during the follow-up visits. Bovine colostrum is relatively inexpensive when compared to other regenerative materials such as bone grafts and barrier membranes. Several colostrum components stimulate wound healing. It has been stated that colostrum's growth factors such as epidermal growth factor, TGF and IGF-1 stimulate regeneration and repair of various body tissues such as bone, ligament, muscle, cartilage, and nerve tissue. Research has shown that colostrum contains TGF-ß which is also produced by osteoblasts, the bone-forming cells. Cell apoptosis among osteoclasts was found to be enhanced by TGF-β. The same factors might have contributed to the healing of periapical bony defect in the present cases; however, further research is necessary to determine the actual mechanism involved in bony healing. Various clinical benefits of bovine colostrum include antibacterial property  component of oral hygiene products in persons with Sjogren's syndrome and oral lichen planus; as a component of mouth rinse to determine the effect on dental plaque; as component of tear substitute in persons with dry eyes; as dietary supplements immunodeficiency-related diarrhea prophylaxis and treatment of infectious diseases such as vibrio cholerae, Helicobacter pylori, and rotavirus; treatment of multiple sclerosis and nonsteroidal anti-inflammatory drug-induced gastrointestinal inflammation and also for presurgical consumption in persons undergoing abdominal surgeries; powdered colostrums for topical application in gingivitis, sensitive teeth, aphthous ulcers, cuts, abrasions, and burns after they have been cleaned and disinfected. The clinical and radiographic evidence of the present cases suggests a positive outcome of colostrum being used as a biomaterial to fill the bony defect after periapical surgery. Colostrum can be used as an alternative to bone grafts, and it is also economical and easily available with favorable outcome. Although there is reasonable bone formation, long-term follow-up and studies based on other radiographic aids are required to evaluate the type and density of bone formed. Demiralp B, Keçeli HG, Muhtarogullar M, Serper A, Demiralp B, Eratalay K. Treatment of periapical inflammatory lesion with the combination of platelet-rich plasma and tricalcium phosphate: A case report. J Endod 2004;30:796-800. Metzger Z, Huber R, Tobis I, Better H. Enhancement of healing kinetics of periapical lesions in dogs by the Apexum procedure. J Endod 2009;35:40-5. Figdor D. Apical periodontitis: A very prevalent problem. Oral Surg Oral Med Oral Pathol Oral Radiol Endod 2002;94:651-2. Abramovitz I, Better H, Shacham A, Shlomi B, Metzger Z. Case selection for apical surgery: A retrospective evaluation of associated factors and rational. J Endod 2002;28:527-30. Stassen LF, Hislop WS, Still DM, Moos KF. Use of anorganic bone in periapical defects following apical surgery – A prospective trial. Br J Oral Maxillofac Surg 1994;32:83-5. Uchin RA. Use of a bioresorbable guided tissue membrane at an adjunct to bony regeneration in cases requiring endodontic surgical intervention. J Endod 1996;22:94-6. Kelly GS. Bovine colostrums: A review of clinical uses. Altern Med Rev 2003;8:378-94. Blum JW, Hammon H. Colostrum effects on the gastrointestinal tract, and on nutritional, endocrine and metabolic parameters in neonatal calves. Livest Prod Sci 2000;66:151-9. Elfstrand L, Lindmark-Mansson H, Paulsson M, Nyberg L, Akesson B. Immunoglobulins, growth factors and growth hormone in bovine colostrum and the effects of processing. Int Dairy J 2002;12:879-87. Roodman GD. Mechanisms of bone metastasis. N Engl J Med 2004;350:1655-64. Ho PC, Lawton JW. Human colostral cells: Phagocytosis and killing of E. coli and C. albicans. J Pediatr 1978;93:910-5. Pedersen AM, Andersen TL, Reibel J, Holmstrup P, Nauntofte B. Oral findings in patients with primary Sjögren's syndrome and oral lichen planus – A preliminary study on the effects of bovine colostrum-containing oral hygiene products. Clin Oral Investig 2002;6:11-20. Loimaranta V, Laine M, Söderling E, Vasara E, Rokka S, Marnila P, et al. Effects of bovine immune and non-immune whey preparations on the composition and pH response of human dental plaque. Eur J Oral Sci 1999;107:244-50. Chaumeil C, Liotet S, Kogbe O. Treatment of severe eye dryness and problematic eye lesions with enriched bovine colostrum. Adv Exp Med Biol 1994;350:595-9.